The last time you had a broken, chipped, or cracked tooth, how long did you have to wait to fix your dental crown? What if you knew of a dental office where you could get a high-quality, beautiful, and permanent dental crown in just a couple hours? Nobody likes being at the dentist longer than they have to. But when you have a chipped, cracked, or broken tooth, you have to get proper care ASAP to repair your tooth with a custom-fit dental crown; otherwise, you risk damaging the tooth’s root and may even lose it! 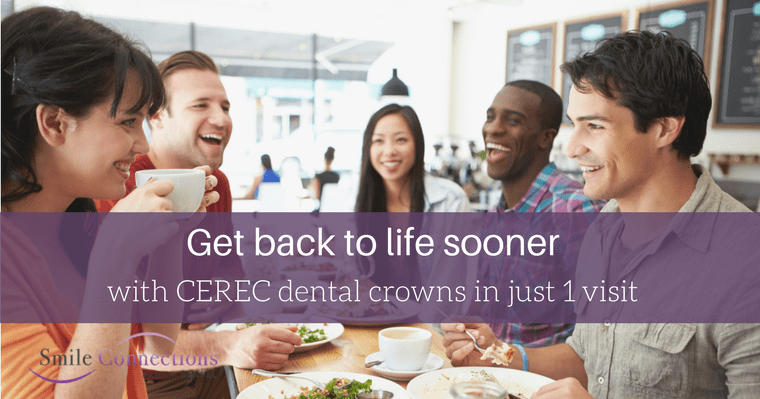 Learn how you can fix your dental crown in just 1 visit with CEREC same-day technology. Back in the day, this process of fixing a dental crown used to take about 2 weeks. On a typical day, you would be chewing on some pistachios or accidentally bite a tiny bone in your meal until suddenly, you feel a sharp pain pulsing into your jaw and neck. After trying to live with the pain a few days, you gave into the voice of wisdom and decided to visit your dentist, albeit begrudgingly. The dentist would then take a look at your tooth and perform any needed cleanup work. After prepping the area, the dentist would then place a gooey clay-like mold for you to bite into and then ask that you hold your mouth wide open for approximately 2 minutes (which felt like an eternity). With that impression of your teeth, the doctor sends your impression to the dental lab to get working on your new replacement tooth (a.k.a. dental crown). You would have to wait about 2 weeks with an uncomfortable and very noticeable temporary fix until your permanent dental crown was complete. At that time, you would return for yet another visit to seat the restoration in its place properly and permanently, IF the restoration sent by the lab was correct. If the dental crown was ill-fitting, then you would repeat the whole process until they got it right. That’s how dental crowns were fixed and most restorative procedures were done back in the day. No wonder most people viewed going to the dentist as a chore, preferring to be anywhere but in the dental chair! Meanwhile, us poor dentists were just trying to help people have all their teeth healthy, smile confidently, and live pain-free. In those days, the 2-week procedure was the best solution available. But today, dental technology has sped up amazingly! In 2017, our advanced CEREC technology allows you to get a brand new, functional and beautiful dental crown in just 1 visit! This incredible CEREC machine is able to craft high-quality and natural-looking crowns in a few minutes! Yes, that means that you can schedule a visit to Smile Connections with Dr. Volker or Dr. Meng, and fix your tooth with a permanent tooth placed in just a couple hours. You no longer have to wear uncomfortable temporary prosthetics for 2 weeks and you don’t have to go through multiple appointments to restore your smile. 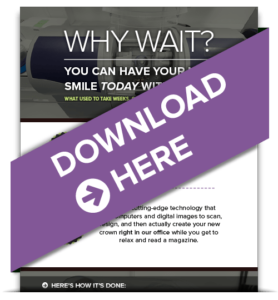 As amazingly simple as that sounds, the CEREC milling technology is quite complex. 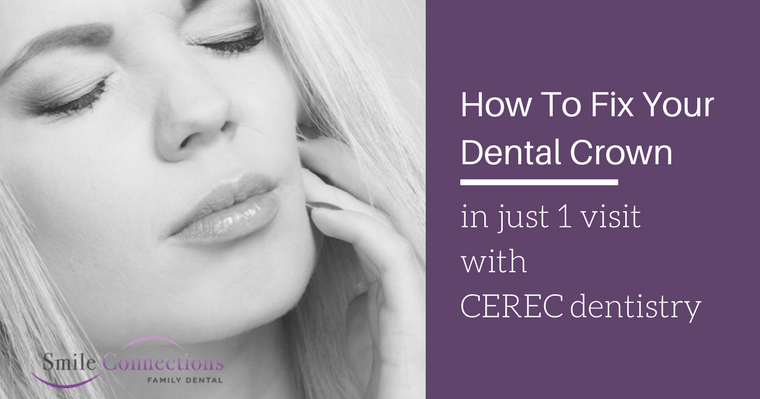 How does CEREC create new dental crowns in 1 visit? Fix Your Dental Crown in Just 1 Quick Visit! Let’s face it; nobody looks forward to needing a dental crown. If your smile needs some restorative work due to unsightly metal fillings and other types of antiquated dental work, then we recommend you schedule an appointment with our dental experts to determine what is the best and easiest way to restore your smile’s beauty and health. The advanced CEREC dental crown and restoration technology coupled with our gentle techniques will make your visit quick and painless, so you can get back to living life with a confident smile. With our artistic vision, we can help reshape your smile and boost your overall health and confidence in just one visit. Share this article with a friend who would benefit from getting their dental crowns restored beautifully in just a single visit!